The fable of Buridan’s donkey tells of a donkey who is profoundly hungry. When put in the exact midpoint between a two identical piles of hay, the donkey was unable to choose which one it wanted and eventually dies of hunger. Ironically, if the donkey had only one and not two piles of hay to choose from, its life would have been easier (and longer). 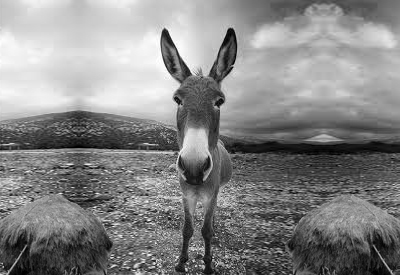 Obviously, people are smarter than Buridan’s donkey – are we? Unfortunately, sometimes we are so preoccupied with making the single best decision that we end up suffering more from the agony of indecisiveness than we do enjoying benefits of the right decision. Being happy with the choices we have made is incredibly difficult. It is also an active research topic of social scientists and psychologists. Harvard psychologist Dan Gilbert’s book Stumbling on Happiness explores the ironic paradox of how the process of making decisions – not the objective characteristics of the decision itself – creates happiness. In one study, Dan Gilbert offered the students in a photography class an enlarged print of two of each student’s favorite works, and asks them to keep one. In one group, the students were told that the decision is final. In the second group, the students were offered the chance to change their choice within a few days. He then asked everyone to rank how much they like the picture they ended up keeping. The remarkable thing is that in both cases, all students had the same objective outcome – they took home an enlarged print of their favorite work. Results? He found that (1) before the course started, most students would prefer to have a chance to regret their choices, and (2) those that could NOT change their choices ended up happier. In fact, some students in the “can change” group were sufficiently ambivalent over their two favorite photographs that they spend the entire time agonizing over whether to regret their choice and get the other one instead. The choice between the two was so difficult they ended up disliking the final outcome regardless of which one they had chosen. They were plagued by the same indecisiveness that killed Buridan’s donkey. This entry was posted in Figure Stuff Out and tagged Happiness, Psychology, Social Science. Bookmark the permalink. Well done. You should check out Barry Schwartz on tyranny of choice, paradox of choice, etc. I have just begun to explore this space – looks like Barry Schwartz has an entire career’s worth of wisdom on this topic. Thanks for recommendation!